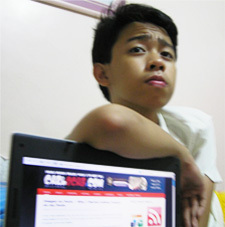 Carl Ocab: 14-Year Old Ranks #1 in Google for "Make Money Online"
It's hard to believe that a 14-year-old kid who started his blog just this past summer, would rank #1 on Google for a highly competitive keyword phrase like “make money online”, isn't it? After attempts to make money online with a tech blog and then a gossip blog failed, Carl Ocab says he was “Heavily Inspired by my Dad, I tried my best to find a broad topic that I can blog about for ages”, so he started blogging about how to “Make Money Online with a 13-year old”. And although you might be skeptical that the genius behind this effort is really only 14, reporters Annalyn Jusay and Abe Olandres from Manila who have interviewed Carl, both verify his age (with pictures) and also comment on his outward shyness. Online, he doesn't seem so shy – with a big ad plastered in his top navigation that reads “I'm on the front page of the bloody competitive keyword “make money online” which goes on to an advertisement for placing your advertising on his site. Smart! Carl's site is worth a look if you want inspiration or linking opportunities from his blog via reviews, advertising, guest blogging, and comments. Whats Carl Ocab’s Site ? Would you share it with us so that we may see what he’s about. You know what… there are a number of kiddo millionaires around made rich from their website. Don’t take it too hard guys. Ever heard of the word genius ? So, why cant a 14 year old beats older folks that their game ? I am a Filipino and upon reading this (though its old post), I’m really amazed how Carlo climbed his way to the top in Google’s SERP with such a very competitive keyword. Oh boy, keep it up! Mabuhay ka! I know that it is hard to believe that a kid like him did something great like that but it certainly true. I dont know about his shyness but i do believe that he is a very nice person and a very confident one. Maybe, he doe not like to brag because he wants people to like him the way he his despite the fact of being a computer genius. He is certainly one of my idols when it comes to blogging. the case of the 16 year old girl that is currently a multi millionare, she got there through marketing her web site. Ha! Now that’s just crazy. A 14 year old kid seems to be outsmarting every Search Engine Marketer online? He HAS to be making a TON of money, I would expect/hope? What an amazing accomplishment! Maybe next, he can grab the number 1 spot for diet. Congratulations to him. An amazing story, for sure! Hi Rosalind – I’d heard of Carl before. But I had no idea he now had the number one spot for that phrase. I’ve read about a few kids who do well online. The girl who owns Whateverlife started it when she was really young and she’s had some huge offers for her business. I think it’s great that the Internet has opened up a whole range of opportunities for kids. It’s created a more even playing ground and it doesn’t matter where they live, where they went to school, or who they know. Ok guys, this is crazy…..if a 14 year old KID, whose native language isn’t english, can take the top spot on Google with just a blog, why, then i ask, can WE not succeed online as well. All it takes is determination AND persistence. Well first of all, thanks for the kind words. These posts always keeps me going. Wheew, I’m glad someone noticed. You’re the first one to blog about the big ad in the header of my blog (It’s been sitting there for months!). That’s actually one factor why I sold out almost all of my ads. About the copywriting on my blog – I have to say, they were intentional. I reread every article I post and replace some words with powerful ones. In my months of blogging, I have read tons of salesletters and stuff on copywriting. I’m not those kids reading comics or watching Spongebob all day long (Although I watch them sometimes to relax). We also bought books about it last month. I’ve been doing my research over the web for the last 15 months since I bought your eBook. I am overwhelmed with so much information I stumble upon and I can’t focus on one niche. I have created blogs to promote reseller hosting, skin care products and even MP3 player articles at Squidoo. The only promotion I made which makes me $300 a month (not bad in Manila currency) is a millionaire dating site. I have posted articles at Hub Pages and Squidoo. I got visitors when I posted an article about Charlie Sheen looking for love from the Internet. I found out that it’s great to write about current news and affairs and try to link or relate them to what you are promoting. But this boy, took the chance of beating John Chow and Darren Rowse for that specific keyword. John Chow tried to outsmart Carl Ocab by asking his subscribers to link to his posts with the anchor tag ‘make money online’. From my research on Carl Ocab’s blog, he has a massive back links with ‘make money online’ anchor tag. The power of ‘off-page’ optimization! Reminds of Adobe’s website. Try to search for the keyword ‘click here’ and Adobe is on top of the results page. You will never find ‘click here’ as keyword on Adobe’s front page. There are guest bloggers for Carl Ocab. ‘Bloody competitive keyword’ – ‘bloody’ is not a term you will here in Manila’s community. It’s more British than colonial American 🙂 And kids below 16 to 18 are not allowed to use similar words even in writing – the Church says it so. But again, having someone write for you (paid or not paid) is a smart idea. The same thought crossed my mind. He does post entries and articles written by a number of ‘guest bloggers’ as well as his dad, but I do believe that he’s blogging the content that is attributed to him. Some of the phrases, grammar and syntax reads like a 14 year old might say it, such as “I asked her back” meaning that he questioned her in response. I was as surprised as you were Rosalind so I checked out his site and it is really professional and the copywriting is impressive. I hate to say it but the writing is so impressive that I have trouble believing that it is him writing these articles. Makes for a great story though doesn’t it?